Having learned that in the 18th and 19th century, people of high status liked to have themselves depicted writing a letter, I started wondering to what extent letter-writing was a central theme in the arts. In Dutch Genre Paintings in the Age of Vermeer (Sutton et al. 2003) I read that – in the Netherlands – the earliest paintings showing figures writing, reading, or handling letters date from the 1630s (Sutton et al. 2003:15). An example for this is a painting by Gerard ter Borch. From the 17th century onwards, the letter became a very popular theme in Dutch genre painting. This also reflects the Dutch culture: The Netherlands were a maritime nation and literacy was a valuable skill for sailors and people living far away from home. Only by writing letters they could keep in touch with their family and friends (Sutton et al. 2003:26). 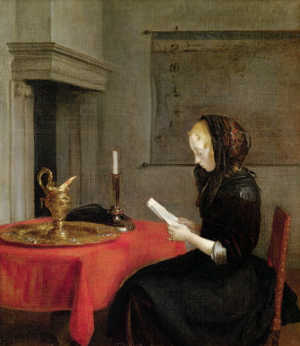 There are numerous paintings from Vermeer and other painters making use of the letter-theme. I think that the popularity of the letter-theme in 17th-19th century paintings is really fascinating, since it says a lot about the importance of letter writing as a cultural practice in those days. Sutton, Peter, Lisa Vergara, and Ann Jensen Adams. 2003. Love Letters:Dutch Genre Paintings in the Age of Vermeer. London: Frances Lincoln Ltd.